Combining Swedish Energy Efficient techniques to create your perfect home. Designing and building a new home is like starting a journey. Consequently our mission is to ensure that your experience is an enjoyable one. We use the highest quality products throughout the design and manufacture process. Concentrating on thermal performance, which is essential for the energy efficiency of your new timber frame home. Furthermore our aim is the same today as when we first started; to supply luxury houses with exceptional build quality. Our guiding principle is to deliver an optimal solution for each customer based on their unique housing needs, whilst maintaining energy efficiency. Hence through experience we have learnt to build a close relationship with our customers and to understand their specific requirements. Svenskhomes’ flexible building system, blended with our friendly and professional service, ensures you enjoy the Svenskhomes Experience. Our objective is to help you create your perfect home to suit your budget and lifestyle. Svenskhomes build bespoke homes tailored to your individual needs. We offer a bespoke design service using our associated architects who can design your perfect home. Furthermore making the best use of your plot and helping you throughout the planning process. Alternatively we can build your home to your own architect’s designs and planning consent, ensuring that you can still benefit from a luxury Svenskhome. For a discerning self-builder or a prestigious custom build project, the Svenskhomes precision engineered building system is the key to your dream eco-friendly home. Welcome to Svenskhomes, your journey starts here. We were looking for a new home and after an internet search of most of Wales this was the first one we visited. Despite it being still in a late stage of construction my wife decided that this was the one as soon as she stepped through the door. I have to say she made the right decision. Lynn and I are very impressed with the quality and design of the house. The upstairs lounge with its cathedral, triple glazed windows leading out to a balcony is spectacular and brings the outside in. To sit on the balcony with an evening drink is a treat. There is something quite magical about the light and airy vaulted ceiling. When we saw the houses, our first thought was how different they were from anything we had seen during our house-hunting experience. 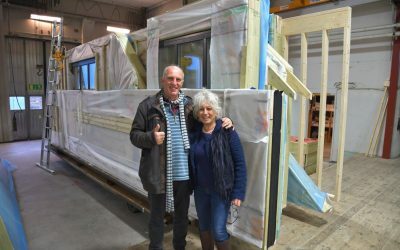 The homes are built to a very high standard, having lived for most of our lives in continental Europe, we appreciate the quality of the insulation in particular. This is the first house since moving back to the UK that we have found to be draught-free and warm! It is also very spacious and light, leaving all our visitors to date highly impressed. Finally, our dealings with Svenskhomes, were very straightforward and amiable. We love our Swedish home and can highly recommend this special way of living. Fairway Lakes Development is located on a splendid 400 acre country estate, just 4 miles west of Great Yarmouth and Gorlston-on-Sea’s stunning sandy beaches, 6 miles from the picturesque Suffolk towns of Beccles and Lowestoft. Don’t miss out on the opportunity to purchase one of the few remaining plots available on this exquisite site. Find out more about Fairway Lakes.